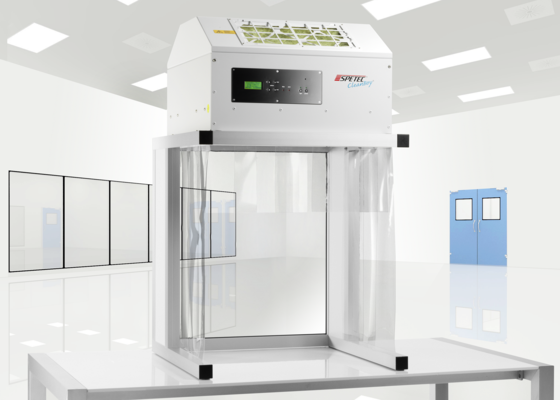 SPETEC is presenting a new product in the field of clean room technology. With CleanBoy, users can achieve highly efficient clean room conditions at any workplace at little investment cost. The need for extremely clean conditions is becoming ever more important in research and production as well as during service operations. The aim of clean room technology is to remove particles of a diameter of 0.12 µm or larger from a defined space in which the most exacting cleanliness standards guarantee a reliable workflow. This can be achieved using a clean room module from the SuSi (Super Silent) series which is positioned directly above the work area. Exceptionally pure, filtered air is then passed over the work area. While the normal indoor atmosphere contains somewhere between 9,000 and 15,000 particles per liter, the use of clean room technology reduces this to a mere 3 particles per liter. Parts or components produced in the mechanical engineering, electronics, optoelectronics, medical or biotechnology industries can be assembled or stored with exceptional reliability. A mobile, wheel-mounted version of the CleanBoy makes it possible to transport the unit to different locations within the company. It is also possible to adapt the dimensions to meet the requirements of problematic workplaces. The use of the CleanBoy in large walk-in spaces results in a defined area in which practically no more particles can be detected. The unit is available in table-top and floor-standing versions. It requires no installation work and is ready for use immediately after delivery.